While it is often perceived that the chiropractor is solely here to treat back and neck pain, this is simply a small piece of what the profession really is capable of handling. Chiropractors not only treat soft and hard tissue problems such as sciatica and joint pain, but are largely called upon to deal with more significant issues such as fibromyalgia, allergies, insomnia, headaches and many more. Chiropractic is based on the idea of removing imbalances both structural and postural in an effort to allow our body to heal itself. For this to happen the network of nerves and signals from your brain, down your spinal cord, to the network of nerves must be allowed to flow freely without any interruption. Chiropractors have the ability and skill to remove these interruptions or misalignments and allow he body to perform as it was meant to. If you have ever been in a car accident, played a sport, fell down or just bumped into something to hard, it’s very possible that you are not functioning at your best due to a misalignment. While there are many potential mechanical or structural causes for misalignment, there are also chemical reasons. For instance, if you smoke or drink excessively or have a poor diet, the chemical issues in your body can eventually cause underlying conditions and disease to appear. The objective of this movement is to realign vertebrae that have moved out of place for a number of reasons ranging from normal daily activity to trauma such as a car accident. An adjustment is often a pressure from the chiropractor utilizing his hands or an instrument to move vertebrae back into place. This happens with a quick movement and is usually without discomfort. You may hear a noise that sounds like you’re cracking your knuckles. This is referred to as joint cavitation and is nothing to be concerned about. The sound you hear is actually the release of gases such as oxygen and nitrogen from the joint. Overall, adjustments are the best way to keep the body functioning at its highest level. When the body is in alignment it is able to respond and perform the way it was designed to. At our office we utilize manual and instrumentation adjusting. When a vertebrae becomes misaligned or moves out of its normal position, this is referred to as a subluxation. Subluxations can be caused by a wide range of issues from a minor slip or bump to a car accident or sudden trauma. 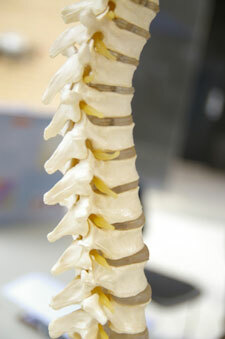 When a vertebrae is subluxated, it begins to put pressure on nerves, blood vessels and everything around it. This pressure comes with a price. The subluxation interrupts the natural pathways that the messages sent from the brain need to be clear in order to be completed properly. As time goes by and a subluxation remains untreated, the spine and the surrounding features can begin to degenerate. This becomes more difficult to reverse as time goes by as the surrounding muscles, nerves and bones begin to adjust to the new shape. The body is an amazing machine. It will start to accommodate these changes by compensating in other areas. The longer this goes on, the more difficult it is and the longer it takes to get back to near perfect position and function. Going to the chiropractor is a new experience for most of us. Maybe we’ve heard through a friend or have done some research online. It’s possible that you are just fed up with living in pain and it’s time to do something about it. In either case, your first visit to the chiropractor will mainly be about getting to know the chiropractor and finding out if chiropractic is right for you. When a patient walks into our office for the first time, they usually comment on the spa-like atmosphere we have created and how comfortable they feel. They are immediately greeted by one of our front desk staff. As they relax with their choice of coffee, tea or water, they will fill out a small amount of paperwork and then be taken back to one of our consultation rooms. The purpose of your consultation is to discuss your current health conditions and any health concerns you may have so Dr. Roth can determine if chiropractic is likely to help you. If it looks like chiropractic can help, a thorough examination will be done to identify the cause of your problem. If not, Dr. Roth will refer you out to someone that may be able to better help you with your problem. Dr. Roth will answer any questions you have at this time also. After everything is complete, we’ll take a look at the overall results of our conversation and exam, and together, we’ll come up with a plan of action which will begin when you are completely satisfied and ready to move forward. Call our Miller Place office now to set up your appointment (631) 675-2910.